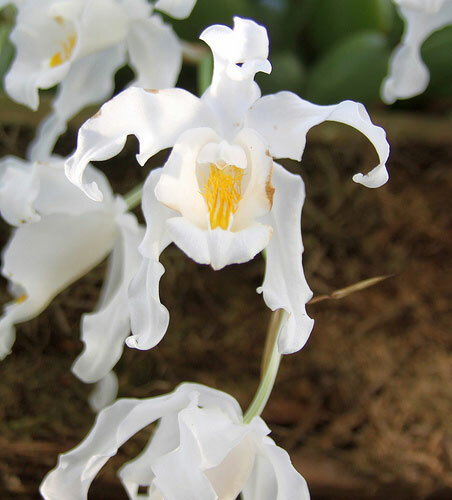 Coelogyne cristata has the largest flowers in the Coelogyne genus. It is a white orchid with yellow "fuzz" inside the flower's lip. They are fragrant. Their native habitat is at high elevations along the edges of the Himalayas, mostly in India. They get significant seasonal variation in the climate due to monsoons; they bloom in the winter when the climate is cool and dry. These orchids are relatively easy to care for, their drought tolerance makes them able to cope with neglect, and the flowers are beautiful; I'm not sure why the species hasn't attracted more attention. These plants are accustomed to seasonal variation in rainfall with the monsoons; during the summer and fall, when the plant is actively growing, they like a lot of water. Don't allow them to dry out much if at all between waterings. But in the winter, they need only infrequent watering, just enough to keep the tips of the newest leaves from turning brown, and to keep the pseudobulbs from shriveling excessively. (A little shriveling is expected.) Resume watering and fertilizing heavily when you see new roots growing. You can grow them mounted if you are able to water multiple times per day during the plant's "monsoon", such as if you have timers on a spray nozzle in a greenhouse. If you can't do that, use a fine potting mix that will retain some moisture without becoming soggy; tree fern, coconut husks, and fine fir bark all work well, sometimes mixed with sphagnum and other materials. They can be grown in pots or baskets; both work well. Repot if needed when new growth starts at the end of dormancy. Humidity should be high, about 70%. It should be somewhat higher when the plant is actively growing, and a bit less during the dry season. Temperatures vary seasonally; during the summer, provide intermediate temperatures of 70-75°F (21-24C) during the day. During winter, they like quite cool temperatures of 50-55°F (10-13C). Temperatures should drop 10-15°F (6-8C) at night. They can tolerate freezes briefly, but will cope better if they are dry at the time. Light should be intermediate to high, 2000-3000 footcandles, a bit less than you'd use for Cattleya. They can adapt to higher light if needed, though; in nature, they often grow in direct sunlight. These plants can quickly mature into very large specimens that have several hundred flowers at a time.